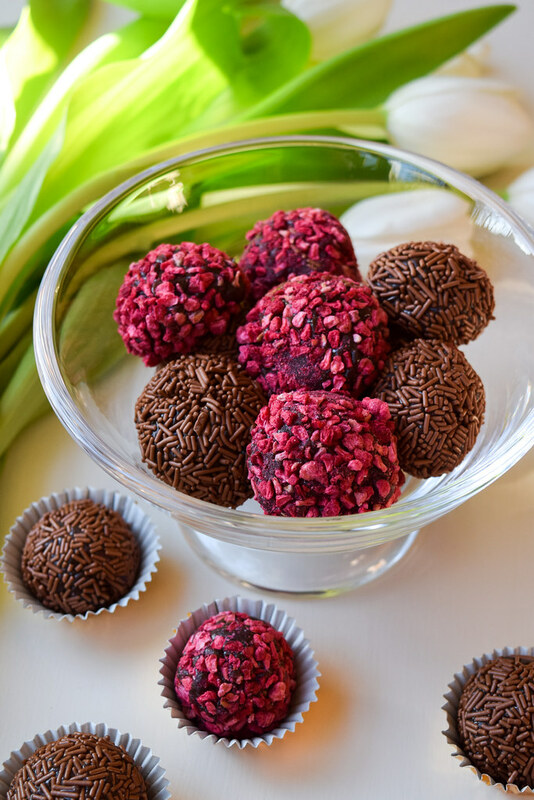 A couple of years ago for a South American, Road to Rio themed summer dinner party I threw I made brigadeiros, a really easy type of Brazilian chocolate truffle to serve with coffee. 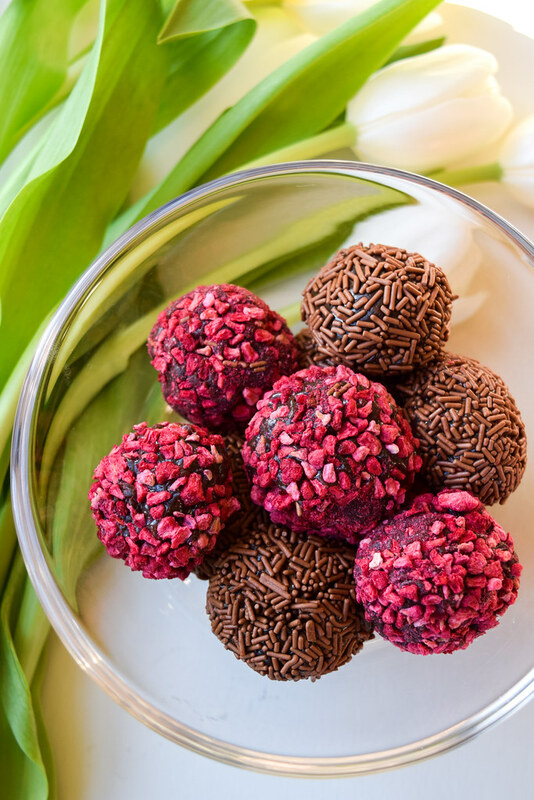 They went down a storm, and when I made them I realised how much more forgiving they are to make than regular, French-style chocolate ganache truffles. So, if handmade, edible gifts are your thing but you struggle with regular homemade chocolates (I have really warm hands – you have no idea how many times I had to wash my hands in between making these Boozy Brussels Sprout Chocolate Truffles over Christmas!) 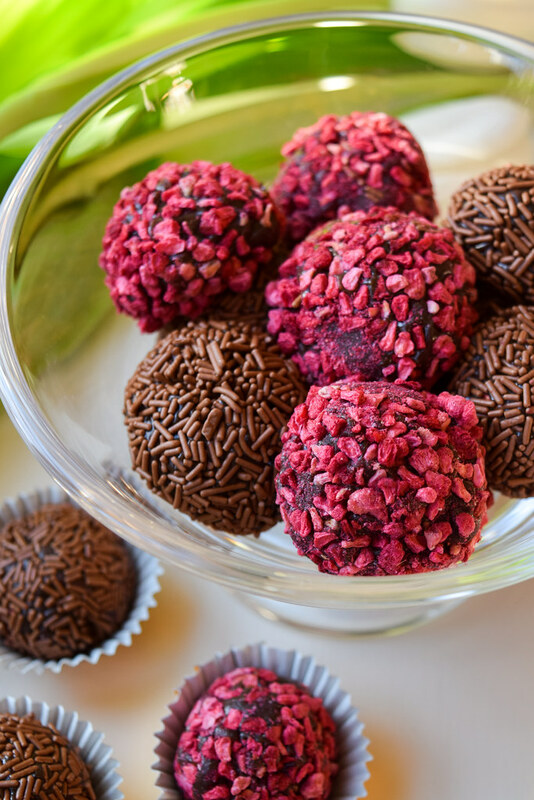 do try making brigadeiros this Valentines Day, rolled traditionally in chocolate vermicelli, and for the holiday in fruity, colourful freeze dried raspberry pieces. 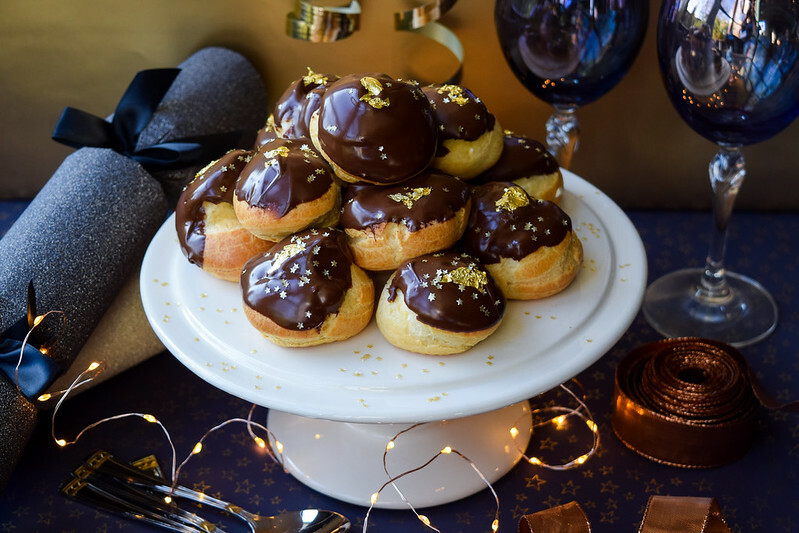 Another thing I love about this recipe is it does not leave you with lots of packets of things once you’d made a 20-truffle batch: it uses a whole tin of condensed milk, one 10g tube of freeze dried raspberry pieces, and a regular 55g tube of chocolate sprinkles. If you can, get good quality chocolate vermicelli rather than chocolate flavoured sugar strands for the best flavour, but the chocolate sugar sprinkles will still work if that is all you can find! 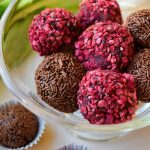 These easy Brazilian truffles are probably the most forgiving truffle recipe you’ll ever try, delicious rolled in traditional chocolate vermicelli or in freeze dried raspberry pieces for Valentines Day. 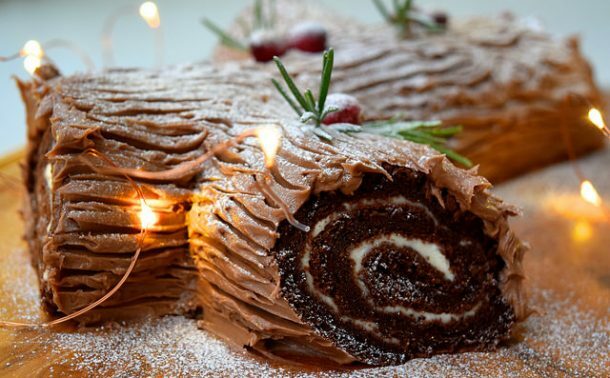 Combine the condensed milk, cocoa powder and sea salt in a medium saucepan and set it over a medium low heat. Stir constantly for around 10 minutes until the mixture has thickened, become glossy, and when you stir it it comes away from the sides of the saucepan. You may not be able to picture it, but you’ll know what I mean when your mixture gets there! Remove the mixture from the heat, and stir in the butter and the vanilla seeds (if using) until the butter has melted and the mixture is smooth. Allow the mixture to cool completely, then transfer to the fridge for at least half an hour. 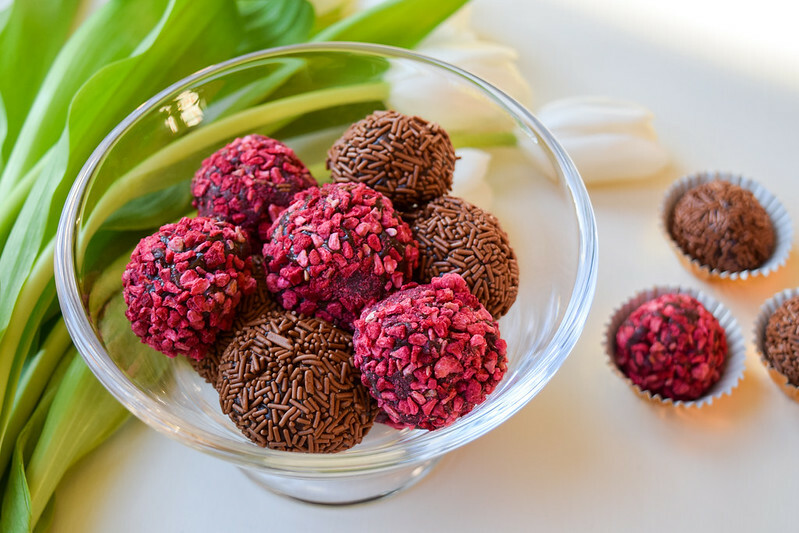 Using a teaspoon, spoon out a truffle sized amount of the mixture, and toss in the vermicelli or the raspberry pieces until coated. Then, between your palms roll the mixture into a ball and transfer to a mini muffin or petit four case. I love you don’t have to make perfect rounds here until you have the sprinkles all over the truffle mixture, stopping your hands getting sticky. 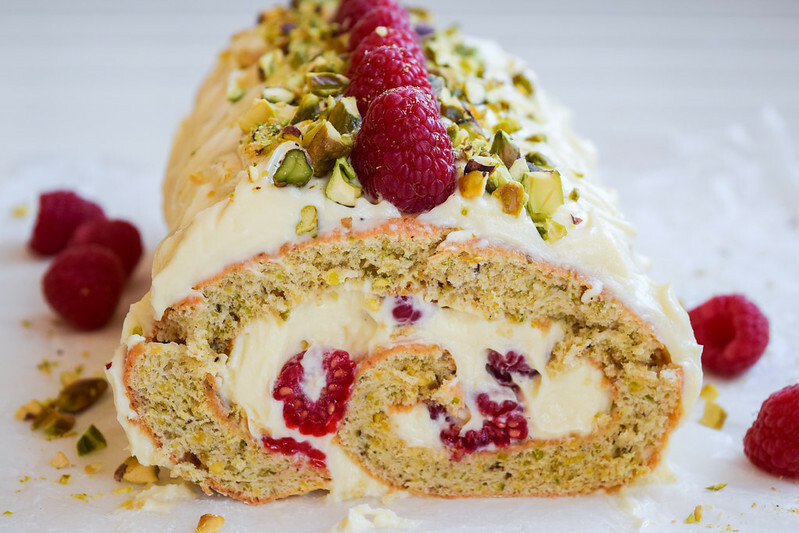 The vermicelli ones will be easier to roll, but I prefer the taste of the raspberry ones! 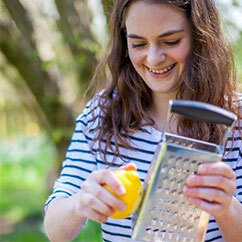 Store in the fridge, but take the truffles out the fridge for 10 minutes before serving. They should last several days, but I find they don’t usually last that long!